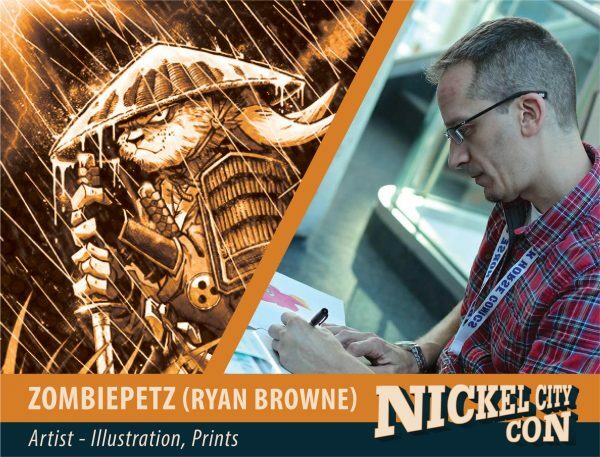 Ryan G. Browne is a New York based artist who has done small press work most recently for IDW publishing (TMNT card series, Garbage Pail Kids cards, and the lead illustrator on the turn-based card game “TRAP”, and Titan comics with Variant covers for Doctor Who and Norman. Along with freelance work for Aspen & Image Comics. Custom comic book and cartoon characters commissions are always available ([email protected])! Recently branching out into zombie related artwork and merchandise. Starting a company called Zombiepetz, which specializes in turning some of your favorite comic and tv characters into zombies, custom work is a specialty. Illustrating a children’s book written by author Carrie Smith.